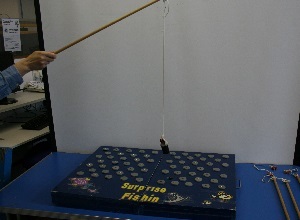 Players use magnetic fishing rods to fish for surprises. More than one person can play at a time. Suitable for young children. Board with 168 holes for film cannisters. Box of cannisters with magnetic lids. Small prizes or raffle tickets to put inside the cannisters.